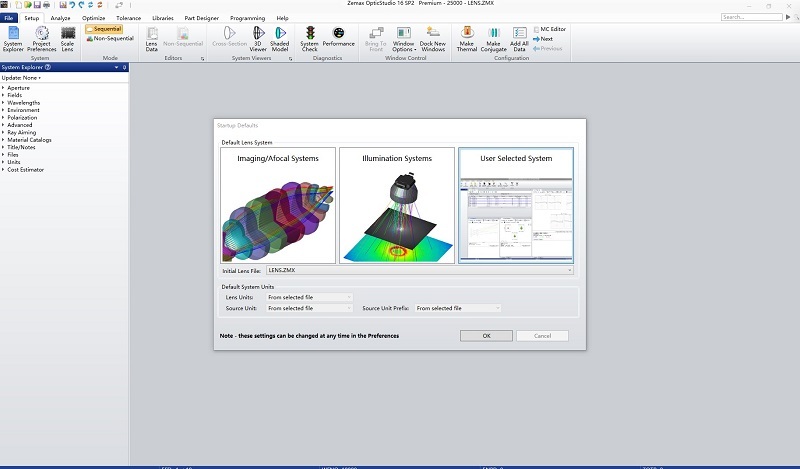 SPEOS is the only optical solution integrated in your CAD software: CATIA V5, NX, Creo, and SOLIDWORKS. At OPTIS, we know that optical simulation cannot be completely separated from the mechanical design world, because optics impacts on so many parts of the overall design process. Every simulation must be included in the CAD/CAM package, to consider the interactions of photons with mechanical geometries. The intuitive approach of the SPEOS interface, associated with its advanced features, makes it easy to use for experts as well as non-specialists in optics, in a wide range of industries. SPEOS improves the speed of design and rendering of optical and optoelectronic devices such as vehicle lights, displays, and cameras. Engineering designers can now model complex integrated mechanical and optical engineering tasks seamlessly with their CAD software. SPEOS virtual simulation is largely used in industry today and it has a great impact on work habits: It allows users to explore and evaluate all any idea, faster than ever. The consequence, is an increasing demand for computing resources. Imagine you can now obtain your simulation results within minutes instead of hours? What will be the impact on your design process? This is now done! With no compromise on quality, SPEOS is now fully compatible with High Performance Computation! You distribute SPEOS calculation on several computers using “on Premises” or “in the Cloud” clusters. To assess your design, you need to experience different materials. Color is important and texture is key: grained, brushed, veined, there are more than 400 words to describe a texture. Texture will inspire your design and help to avoid bad surprises, like a dangerous reflection on the windshield of a car. OPTIS has always been a leader in simulating materials. Thanks to “texture mapping” you can simulate the exact effect and the perception of textured materials. In the RSoft OptSim™ tool, new discrete multi-tone (DMT) modulation format functions are available in the digital signal processing library to model and simulate DMT-based data links. The DMT format uses light intensity for modulation over multiple subcarriers, which provides higher spectral efficiency. It is particularly useful for optimizing the performance of short-reach applications such as automotive data links, access networks as well as 100G and 400G Ethernet-based data center links. The RSoft OptSim Circuit tool includes the latest American Institute for Manufacturing Integrated Photonics (AIM Photonics) Process Design Kit (PDK), version 1.0b. The PDK helps PIC designers access leading-edge silicon photonics technology to generate PICs for fabrication through AIM Photonics multi-project wafer facilities. OptSim Circuit users will be able to access the PDK elements, generate schematics and simulate circuit performance prior to exporting net lists for mask generation. In addition, OptSim Circuit includes new and updated libraries for supporting PDAFlow-compatible PDKs for PIC fabrication. Support for large-core fiber power-versus-angle signal domain across select models. The feature extends the large-core multimode fiber’s numerically efficient power-versus-angle approach for signal propagation to other models in ModeSYS to model a complete data transmission link. A new large-core connector model that is computationally more efficient than conventional spatial field-profile based connector models. Sentaurus TCAD interface usability improvements, including support for dispersive materials and dynamic updating of materials and simulation domain. The RSoft-Sentaurus TCAD interface enables unified simulation of advanced opto-electronic devices. Support for general monitor objects in BeamPROP. This allows broader use of BeamPROP with the Sentaurus TCAD interface for applications such as waveguide photodetectors. Speeds simulations of waveguide photodetectors by as much as 100x. Improved BSDF scattering calculation, including more robust scattering calculations of polarization-dependent effects. Enhanced RSoft CAD environment hierarchy features, including the ability to publicize design variables and allow a wider range of variables such as material choice. This enhances the ability to generate reusable sub-circuits and is utilized in the unit cell library for the dynamic array feature. Updated remaining 32-bit utilities, including MOST™, to 64 bit. The LucidShape product family provides a complete set of design, simulation and analysis tools for the development of automotive forward, rear and exterior lighting. Backed by cutting-edge, proprietary algorithms to calculate optical surfaces optimized for automotive applications, LucidShape empowers designers to develop, verify, visualize and deliver high-quality designs while reducing product development time. Automotive headlight analysis based on the U.S. Insurance Institute for Highway Safety (IIHS) headlight test guidelines. This allows designers to perform these types of analysis: Illuminance-based visibility range testing, glare test for oncoming traffic, and overall headlight results, ranging from good to poor. The new MacroFocal Torus Optic tool, which creates pillow optics and cylinder flutes for decorative styling. It is particularly useful for designing signal lights and tail lights, but can also be used to create and adjust any pillowed surface on a grid. The Torus Optic tool works with the proprietary algorithms in LucidShape software to automatically calculate and construct optical surfaces based on user-defined illuminance and intensity patterns. Improved organization and usability of the UV Data Properties dialog box. It has been rearranged into four sections to: ranges and presets, data display, overlay, and color tone mapping. In addition, the UV Data Properties dialog box now includes the ability to define presets for display properties and custom isolines. LightTools 8.5 includes new and enhanced features for the design of optical components used in general lighting systems, freeform optics, light guides and backlit displays. LightTools 8.5 introduces an expanded set of mapping options for surface receivers on non-planar surfaces, known collectively as conformal receivers. New in this version are spherical and UV mesh mapping options, which eliminate the need to project illuminance data collected on complex surfaces onto planar meshes, and make interpretation and optimization much easier. Designers can vary the number of bins in the mesh or set the desired bin size, and use the same filtering, analysis and optimization capabilities that exist for planar meshes. Conformal receivers can be particularly useful for analyzing complex elements such as freeform surfaces combined with LED sources. LightTools displays a raster image of illuminance output in its 3D Design view so that designers can visualize the orientation and distribution of illuminance data relative to model geometry. This capability has been expanded to receivers on most surface types in LightTools. In addition, the appearance of the illuminance data can be controlled by settings for color scheme, scaling, and linear and logarithmic settings, as well as contours, mesh lines, smoothing and lit effects. The new Parameter Sensitivity Analyzer automates analysis of the impact of system variables on specified performance metrics, helping you quickly reach an optimal design solution. Key features include support for multiple configurations, parameter lists for non-uniformly spaced variable states and non-numeric variables, and the ability to run scripts after variable values are changed or after each evaluation cycle is complete. Supports multiple chart views for detailed performance analysis. The Freeform Designer assists with the design and optimization of freeform reflective and refractive optical surfaces based on an illuminance or intensity target distribution, source collection angle and distribution, as well as other geometry settings. A new conic lens option provides greater flexibility for surface definitions, including the ability to define a flat surface displaced from the source. The conic lens option is a powerful tool to increase the collection efficiency of point and extended light sources used in compact, energy-efficient illumination systems. The design of light guides that are meant to emit light evenly along the length of the pipe can be a challenging design problem. The Light Guide Designer automates the design process, providing tools for constructing, analyzing and optimizing light pipes and their extraction features to improve output. New profile shapes, geometry controls and analysis improvements enhance the tool’s flexibility and ease of use, and provide more options for innovative shaping and improved efficiency. In CODE V version 11.1, optical designers can now directly access through-focus MTF during lens system optimization, which facilitates fast, accurate improvements to MTF symmetry over focus without the need to manually adjust lens system parameters. This feature can be particularly useful for determining the optimal location of sensors relative to compact camera modules to improve manufacturability. The CODE V visualization tools Display Lens (VIE) and Draw Lens (DRA) are enhanced in version 11.1 to improve rendering of small, highly aspheric lenses, such as those found in smartphones. CODE V version 11.0 introduces the CODE V SpecBuilder™ and SpecEvaluator™ tools. Optical system designers typically use a table of specifications and goals to describe the requirements and design objectives for an optical system. In CODE V, you can use the SpecBuilder tool to create a Specifications and Goals Table. At any point in your project cycle you can use the SpecEvaluator tool to evaluate your optical system against specs and goals to help ensure that a design meets specs, as well as to maintain continuity and consistency between design versions, multiple designers and design phases. The simple, intuitive CODE V SpecBuilder tool lets you quickly build a complete set of optical design project specifications and goals. The CODE V SpecEvaluator tool allows you to instantly assess your optical system design versus project specifications. New stray light analysis tools help identify and block unwanted rays in optical systems and streamline stray light analysis to deliver accurate, consistent results faster. Optical engineers working on biomedical, automotive lighting, and other applications that use phosphors and fluorescent materials can now model a wider range of these materials. Usability improvements include faster rendering of analysis windows, and faster results in Layout plots and Shaded Model plots when modifying designs. Plus, you can now transfer your soft key license from one computer to another in two easy steps. This release includes the new Bernhard Halle Lens Catalog, new Nikon Material Catalog, and updated catalogs from NHG, Ohara, Zeon, and Hoya.